Background: Conjugates of bisphosphonates with macrocyclic chelators possess high potential in bone targeted radionuclide imaging and therapy. DOTAZOL, zoledronic acid conjugated to DOTA (1,4,7,10-tetraazacyclododecane-1,4,7,10-tetraacetic acid), demonstrated promising results in vivo in small animals as well as in first patient applications using 68Ga for diagnosis via PET and the lowenergy β-emitter 177Lu for therapy of painful bone metastases. In consideration of the fact that targeted α-therapy probably offers various advantages over the use of β--emitters, the 225Ac-labelled derivative [225Ac]Ac-DOTAZOL was synthesized and evaluated in vivo. Here, we report on radiolabelling and biodistribution of [225Ac]Ac-DOTAZOL in healthy Wistar rats. Methods: DOTAZOL was labelled with 225Ac and injected without further purification into the tail vein with activities of 404 ± 47 kBq per animal. Ex vivo biodistribution studies were performed in healthy Wistar rats at 1 hour, 24 hours, 5 days and 10 days post injection. The accumulation of [225Ac]Ac- DOTAZOL on healthy bone and soft tissue organs was determined in terms of SUV. The results were compared to those of other radiolabelled bisphosphonates such as [68Ga]Ga-DOTAZOL and [177Lu]Lu- DOTAZOL. A group of 7 animals was observed over a period of 3 month after application of 394 kBq ± 10 kBq of [225Ac]Ac-DOTAZOL for signs of toxicity. After 3 months, kidneys were microscopically analysed for signs of chronic kidney damage. 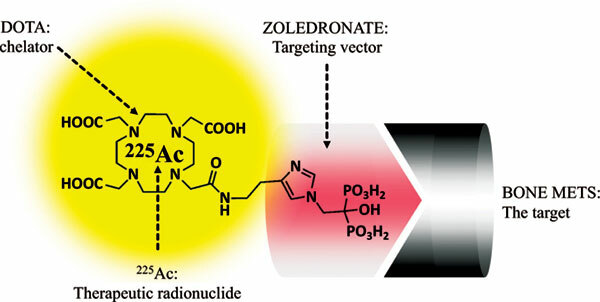 Results: Radiolabelling of DOTAZOL with 225Ac at 98 °C provided radiochemical yields ≥98 % within 30 minutes. [225Ac]Ac-DOTAZOL showed high femur uptake (SUVfemur = 4.99 ± 0.97, 10 d p.i. ), which was comparable to that of other Me(III)-DOTAZOL derivatives. Ratios between bone uptake and blood pool activity reached levels of 5, 940, 2181 and 2409 at 1 hour, 24 hours, 5 days and 10 days post injection. During the observation period of the first two month no toxicity was observed clinically. Histopathology of kidneys after 3 month revealed significant tubular damage in most of the animals. Conclusion: [225Ac]Ac-DOTAZOL repeats the well-known pharmacology of DOTAZOL derivatives in preclinical evaluations. It thus may be considered for translational application together with strategies to reduce renal toxicity. Bone metastases, bisphosphonates, zoledronic acid, 225Ac, theranostics, α-emitter, radiolabelling.